McDowell County birth, death, and marriage records (1917 to the present) are available, to close relatives and those with a legal interest, from West Virginia's Vital Registration Office. Birth records are generally made public after 100 years, death, marriage, and divorce records after 50 years. The McDowell County Clerk provides earlier vital records and divorce records. 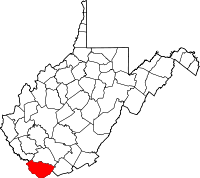 Created in 1858 from Tazewell County, Virginia, McDowell County was named for Virginia Governor and Representative James McDowell. The county boasts the country's first war memorial dedicated to African-American World War I veterans and is home to Minnie Buckingham Harper, first female African-American state legislator in the United States (1928).